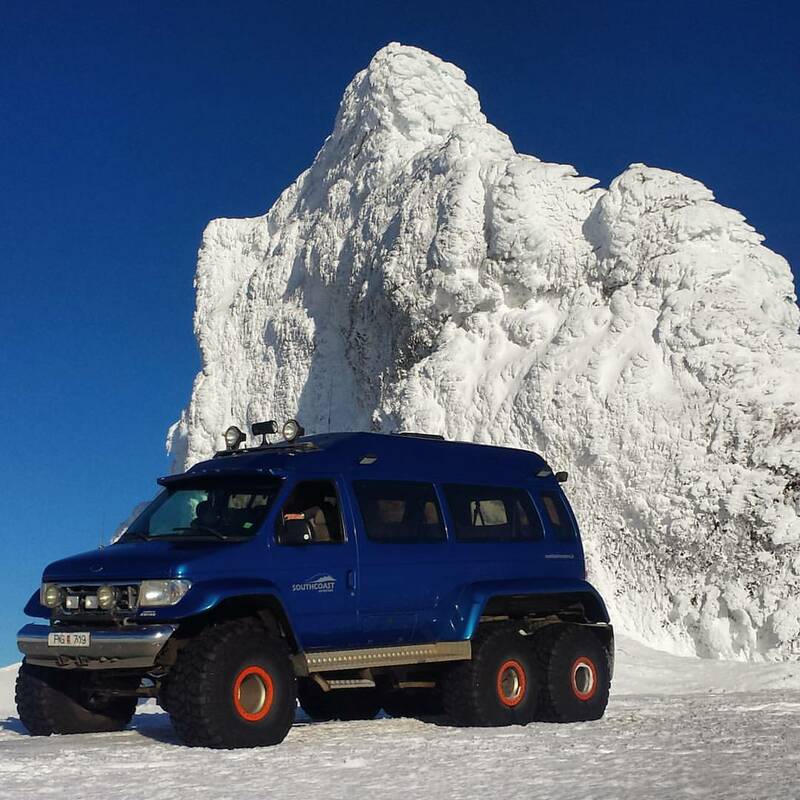 Get up close and personal with Iceland’s most infamous glacier volcano Eyjafjallajökull, on this Super Jeep excursion on the South Coast. If you want to experience the views from atop the site of the 2010 eruption that made headlines around the world, this adventure-packed tour is a unique opportunity to do so. Your journey begins at the campsite next to the famous waterfall Seljalandsfoss. There, you will meet your guide and board your vehicle, a specially modified super jeep capable of treading Iceland’s treacherous Highland roads, and begin ascending up the snowy slopes of the one and only Eyjafjallajökull. Eyjafjallajökull is a powerful volcano of which the caldera is covered by a glistening ice cap. The summit of this natural marvel reaches 1,666 metres (5,465 feet), and it is known to have frequently erupted since the last glacial period. The latest eruption took place in 2010, causing enormous disruption to air travel across western and northern Europe over a period of six days. While some weren’t happy with their travel plans being disrupted due to the dark clouds of ash that took over the skies, others flocked to the land of ice and fire to awe at the visibility of the earth’s powers. Now, you too can witness this site personally and conquer the glacier with ease from the comforts of your super jeep. The views from the top stretch across the wild and uninhabited Highlands, the scenic and celebrated South Coast, and the Westman Islands, where they rest stoically out in the roaring Atlantic Ocean. The scenery on top of the glacier is another highlight of the tour, where you can expect to see the sun reflecting on the snowy ground, dotted with various ice formations, all wrapped up in the crispest mountain air you have ever breathed. Bask in the fact that you will be walking atop a glacier, without having to hike for hours. It goes without saying that whatever you do, don’t forget to bring your camera along for all the otherworldly photo opportunities of your journey. Don’t wait any longer in securing your spot on this tour now, to conquer one of the most infamous glaciers in the world. Check availability by choosing a date. Our meeting point is located at Gljúfrabúi Waterfall / Hamragarðar Campground, just 500m from Seljalandsfoss Waterfall, Road 249. We really enjoyed our day with Magnus! Not only was the ride exciting, including quite a few rescues of other jeeps caught in slushy parts of the ride, but he offered a lot of insight into Icelandic life & interesting history surrounding the lava beaches, glaciers & waterfalls. It was great to get out of the jeep at various locations & venture further in to see the amazing sites. The step ladder he pulled out at ever stop was a plus for me being 5’3”! Definitely glad we did this tour on our trip-very worthwhile & enjoyable!